While it’s not necessary, using miniatures in role playing games can often add to the experience. 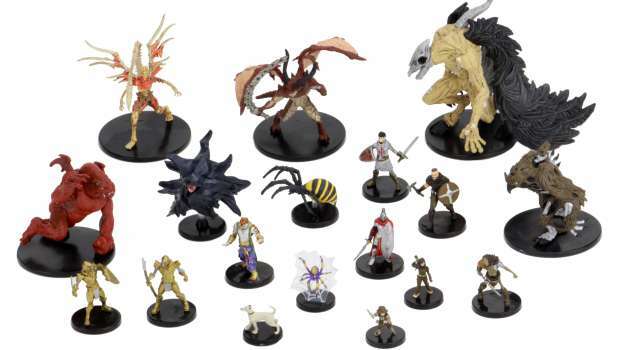 WizKids has created some great ones for use specifically with Pathfinder, and they have just announced that their next set Crown of Fangs will be coming in May. WizKids, the industry leader in quality pre-painted plastic miniatures, is pleased to announce Pathfinder Battles: Crown of Fangs will be hitting a FLGS near you this May! The award-winning Pathfinder Battles line of miniatures from Paizo returns with a new set of 52 characters in Crown of Fangs. Crown of Fangs follows the lead of popular Pathfinder Battles sets like Deadly Foes to provide a legion of high-utility monsters and heroes suitable for any fantasy role-playing campaign. From fearsome skeletons to Red Mantis Assassins, Grey Maidens, and rare “dungeon dressing” inserts that add realism and fun to your fantasy gaming, Crown of Fangs is packed with the adversaries your game is looking for. The Crown of Fangs set will also launch with a special case incentive called, Court of the Crimson Throne. Standing several inches tall, the Court of the Crimson Throne not only doubles as a beautiful display piece, but it also contains the perfect enemies for your next Crown of Fangs adventure! Pathfinder Battles: Crown of Fangs will be available at your FLGS in May with boosters priced at $15.99. Pre-order at your FLGS today! They look spectacular, with plenty of detail. Check them out at your local store, especially if you don’t have the time or talent to paint their unpainted line.